Last Thursday morning officially kicked off the Friends For Life 2012 conference program. Appropriately, for me, it started with a plate full of bacon. I love breakfast any time, but I especially love breakfast at Friends For Life. Imagine being in an environment where everything you want to eat, from salads and entrees to sides and desserts, is carb counted, serving sizes are indicated, and everything is delicious. That’s food at Friends For Life. A very special thanks to one Mike Schurig, aka Food Dude, for all of the yellow and green cards indicating nutritional values, making sure that there were Celiac-friendly options, and for helping to make sure that people with diabetes (PWDs) and their families had excellent food options to choose from. 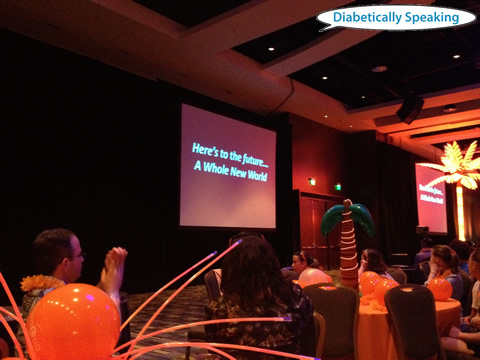 Coupled with breakfast on Thursday morning was the opening keynote address by Tom Karlya, aka Diabetes Dad. He encouraged everyone at Friends For Life to not be satisfied with sitting on the sidelines, but to get up and do something to make a difference in the world, no matter how big or small it may seem. Then he showed us this video of Derek Redmond and his father from the 1992 Olympics in Barcelona. Tom had a very simple message for everyone: Don’t just do nothing. Friends For Life was started because one family was going on vacation in Orlando, Florida and they decided to spread the word and see who all else with diabetes might show up. 500 people showed up, and Friends For Life was born. I had a boss once who said to think about the things that people would remember 100 years from now, and make those things the focus of your life’s work. I can’t say for certain that there is anything that I have done (yet) that will be remembered 100 years from now, but if I can make the life of a person with diabetes better, then I feel like I’m on the right track. Don’t just sit on the sidelines when you know that there are people in the world that you can help. Like Derek Redmond’s dad, get up, push through the barriers, and act. As much help as we may need ourselves, we can do even more when we help each other. Together, we can make a difference. That is what Friends For Life is about, that is what Students With Diabetes is about, and that is what being a person with diabetes should be about. We can self-promote ourselves all day long, and sometimes that is exactly what it takes to get things moving in a positive direction, but at the end of the day it is the lives that we have made better that count the most.